Hotel Casa Rafeleta is in Plan (Chistau Valley), one of the Pyrenean valleys in the province of Huesca. 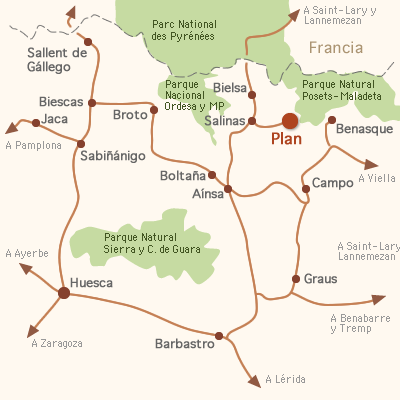 From Lérida or Huesca: Take the N-340, going north towards Ainsa and France (via Bielsa) in the town of Barbastro. Then follow the directions from Ainsa. Coming from the west: Drive through Jaca, Sabiñanigo, Biescas, and then take the Cotefablo Pass through Broto that will bring you to Ainsa. Then follow the next set of directions. From Ainsa: Drive northward towards Plan, Bielsa and France. After 25 Km. take a right (Plan y Valle de Chistau). Without leaving the main road which passes through various tunnels, proceed 14 Km. until your arrival in Plan. From France: Take the Bielsa tunnel and after 20 Km. take a left indicated by the sign: Plan y Valle de Chistau. Without leaving the main road which passes through various tunnels, proceed 14 Km. until your arrival in Plan. IMPORTANT: If coming from the south, in Huesca, always go towards Barbastro from which you will go towards Ainsa. Never turn towards Sabiñanigo or the Monrepós pass even though some GPS will erroneously direct you towards there.